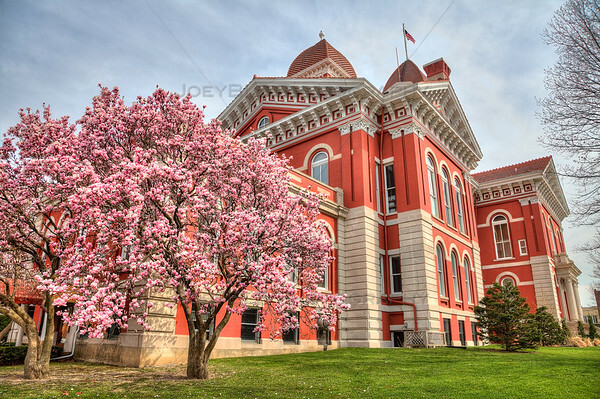 Magnolia trees in full bloom surrounding the Old Lake County Court House in downtown Crown Point, Indiana. One of many spring photos of Northwest Indiana taken in the 2015 spring season. Downtown Crown Point is beautiful in the spring, as several magnolia trees surround the the square on all sides of the court house. You can smell all of the blooms as you walk the downtown streets! See the entire collection of my Northwest Indiana photos at my new website dedicated to Northwest Indiana photos. Spring in Crown Point, Indiana by Joey B. Lax-Salinas is licensed under a Creative Commons Attribution-NonCommercial-NoDerivs 3.0 Unported License. Permissions beyond the scope of this license may be available at http://www.joeyblsphotography.com.